Royal cake takes the (Mcvities) biscuit. One of our oldest customers, McVitie’s has been commissioned to make a chocolate fridge cake for Prince William. 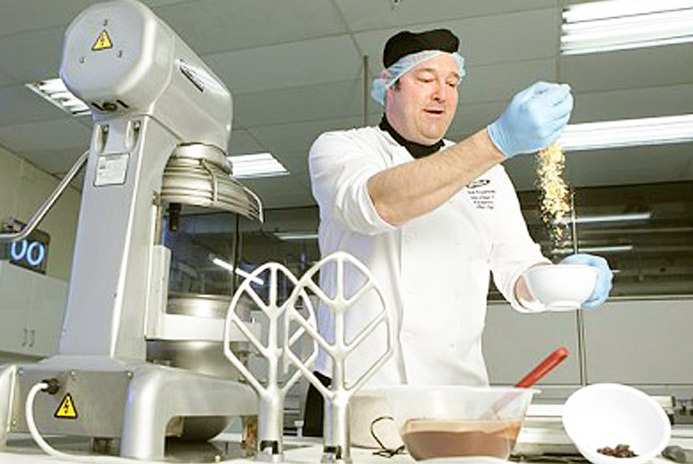 Paul Courtney (pictured) is the chief of cake design and also the development head chef at Mcvities, United Biscuits. Paul is a former pastry chef, who trained at the Savoy and worked in a number of restaurants. Paul is continuing a proud tradition in McVities. In 2007 he’d helped with the baking of the official cake (fruitcake and marzipan) for the diamond wedding anniversary of the Queen and Duke of Edinburgh. McVitie’s also baked the cake for the marriage of George V to Queen Mary back in 1893, and for the Queen’s wedding in 1947 (it was 9ft tall and 4ft in diameter). Eastick’s Golden Syrup vital ingredient for Royal cake.